Also be sure to check out our online Albums for more photos! 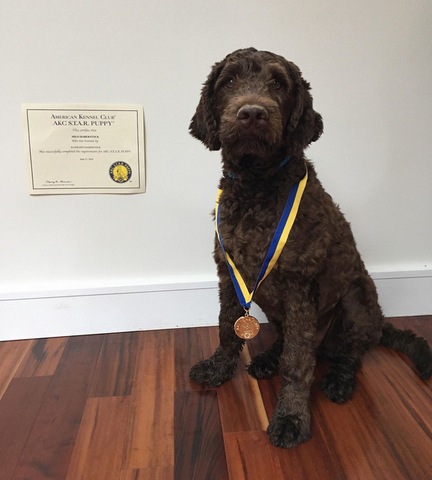 Congratulations Cosmo (above) and Milo (below) on your recent AKC S.T.A.R. 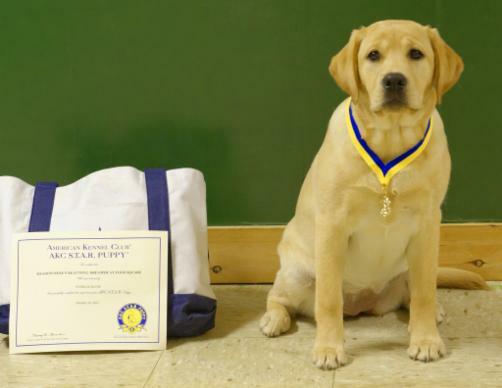 Puppy Certificates! Eve and Kendra earning BOS and BOW for 2pts toward their Championship! Rowan and Edie earning a new Beginner Novice Title with a 3rd placement! Nakita and Morgan earning a new Beginner Novice title with a 1st placement! 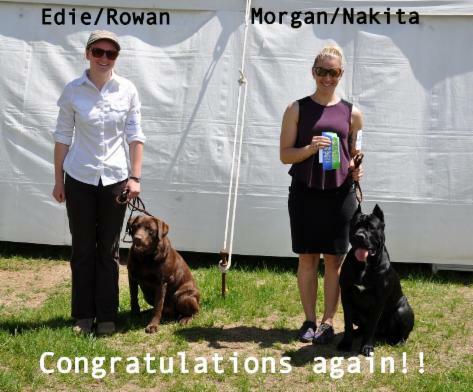 Nakita, Rowen and Gunner all NEW Beginner Novice Titles with placements! Eve earning RAE legs with placements! 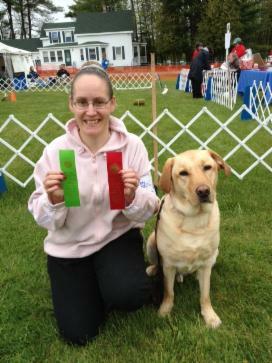 Jax and Gunner earning Beginner Novice legs and placements! 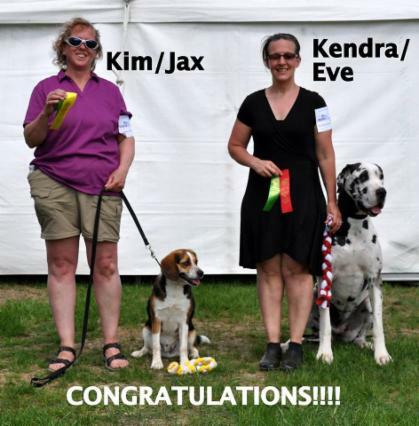 Jax and Kim along with Eve and Kendra qualifying in Beginner Novice! A new title and placements in Beginner Novice competition! 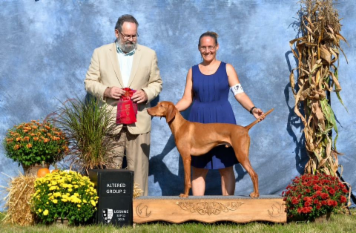 Jax and Kim earning a new Beginner Novice title! Rowen and Edie along with Nakita and Morgan earning qualifying Beginner Novice scores and placements! Nakita and Morgan earning a Beginner Novice leg and 1st place! 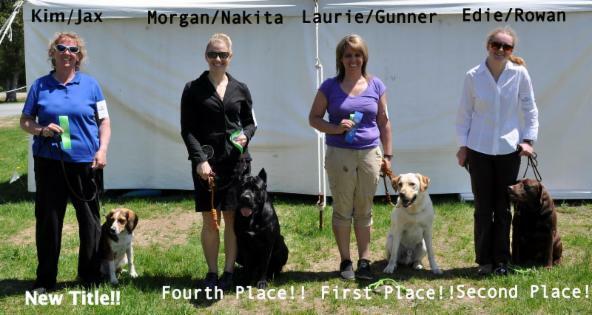 Storm and Kendra earning a Puppy Group 3 from the 4-6m competition class! 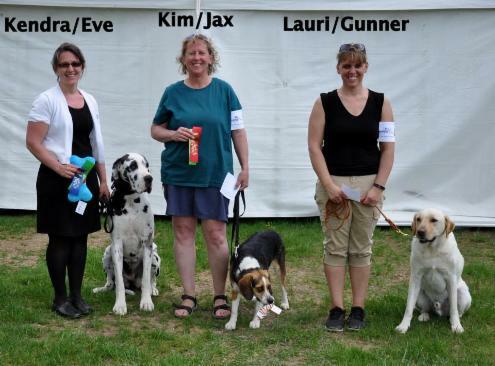 Ella and Maureen earning their UKC Rally Level1 title with three 1sts and two High In Rally Trial awards! Ella and Maureen earning their Rally Novice and Beginner Novice titles with two 1sts and a 3rd in each! 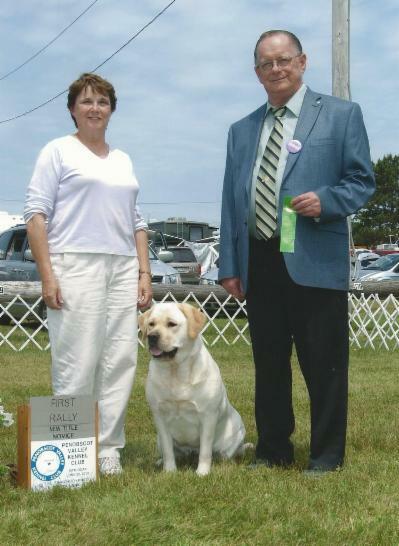 Renae and Sherlock earning their Canine Good Citizen Certificate! 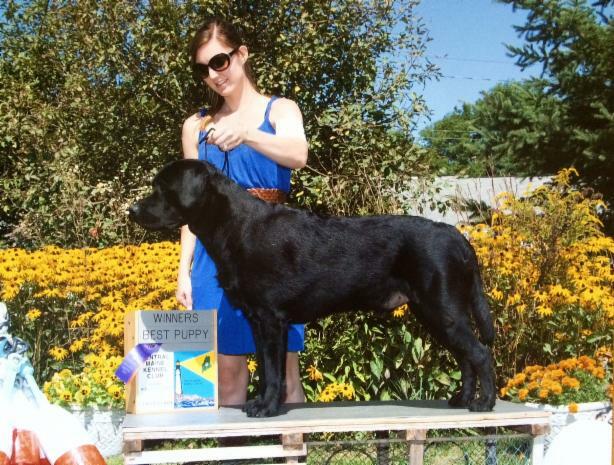 Sherlock and Renae earning back to back Group 2 placements at their first UKC competition Sept 2015! 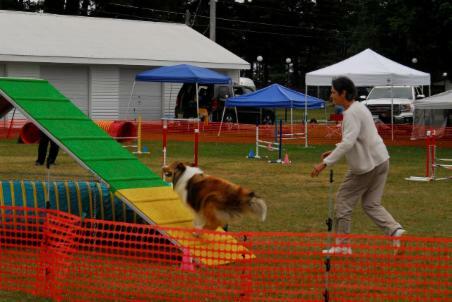 Teddy and Linda earning qualifying scores in their first agility trial! 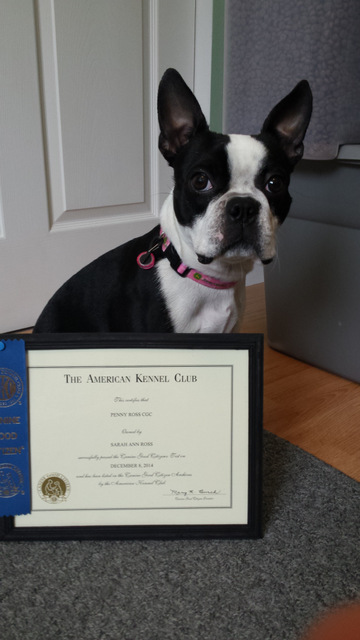 Penny earning her Canine Good Citizen title! 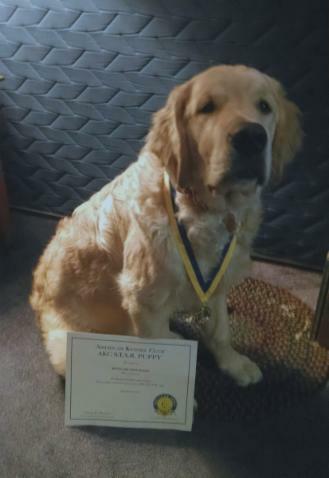 Renegade earning his STAR Puppy Award! 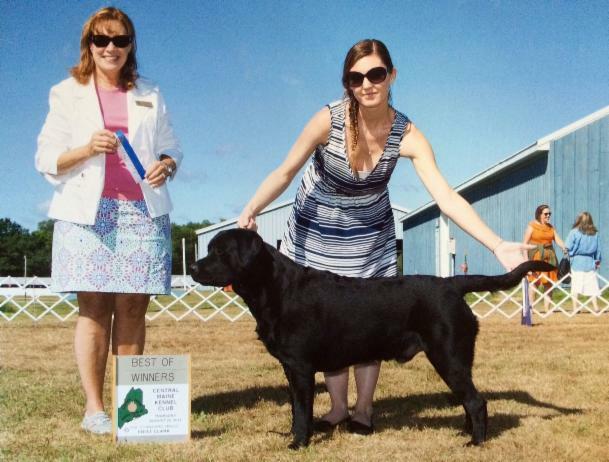 Cruize and Maureen taking back to back majors (3 & 4pts) to finish their Championship 11/22/14 Springfield, MA! 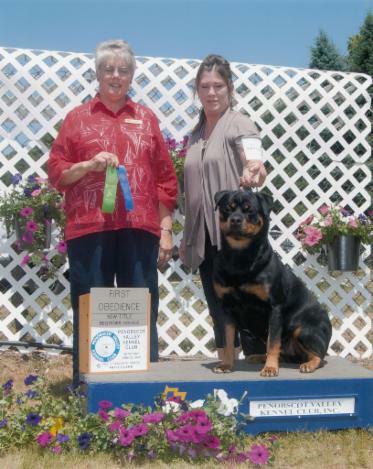 Jag and Reva going Winners Dog and Best of Breed Puppy! 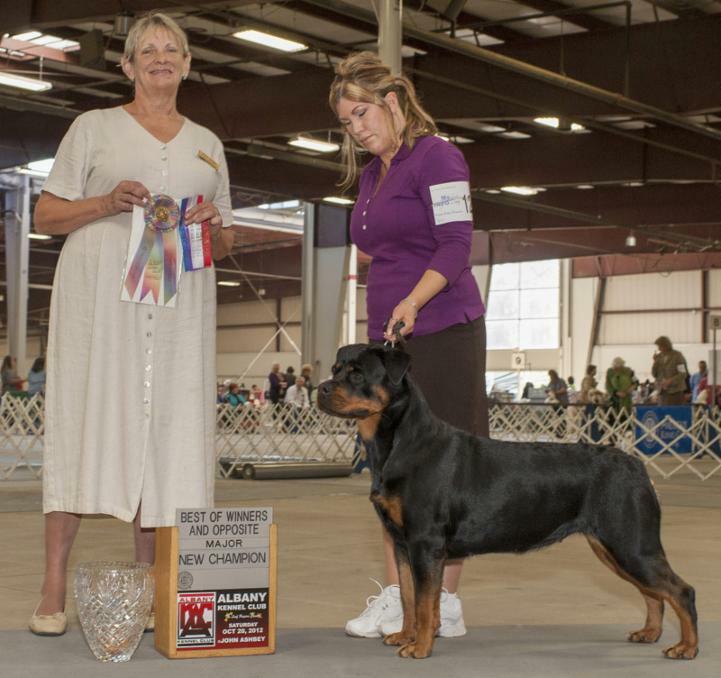 Jag and Reva earning a Puppy Group 2! 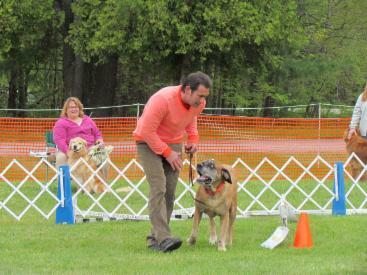 Jag and Reva going BOW from the 6-9m Puppy Class! 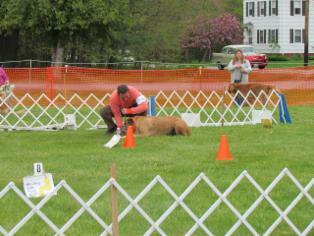 Maureen and Cruize going BOB over Specials and Group 1 from the Open Dog Class! 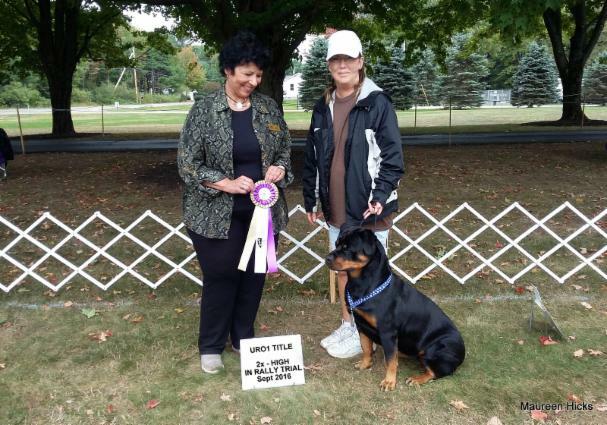 Reva and Jag going Reserve Winners Dog from the 6-9m Puppy Class! 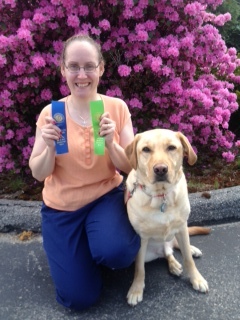 Reva and Bentley earning their new Rally Advanced Title! 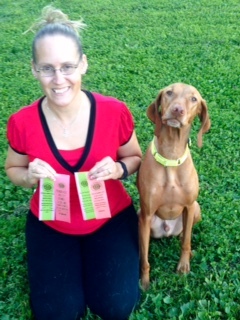 Renae and Dakotah earn a new CD Obedience Title with a 1st place! 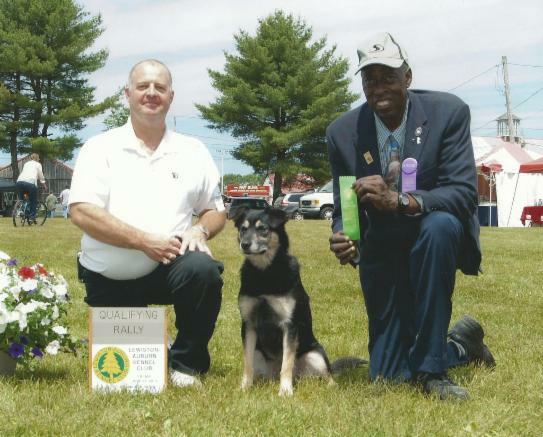 Trueman after graduating Intermediate Obedience Class...making friend with the goats! 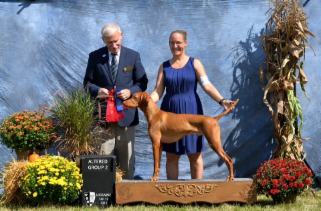 New AKC STAR Puppy Gabby owned by Patty! 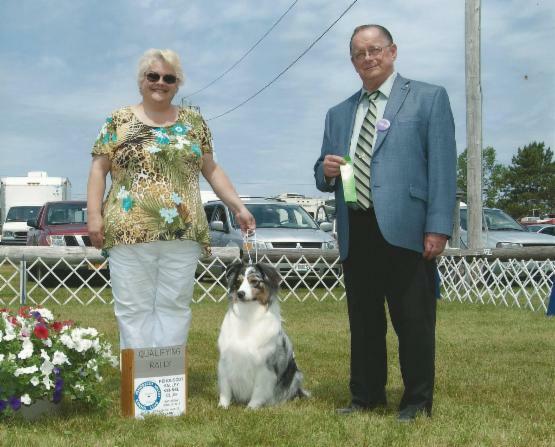 Maureen and Cruize earning 2pts by going Winners Dog at the Albany KC Dog Shows Oct 2013! 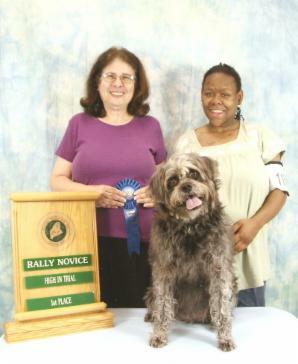 Fritz and Soca (nearly 10yrs of age) earning a 2nd Rally Nov Ob leg with a 1st Placement! 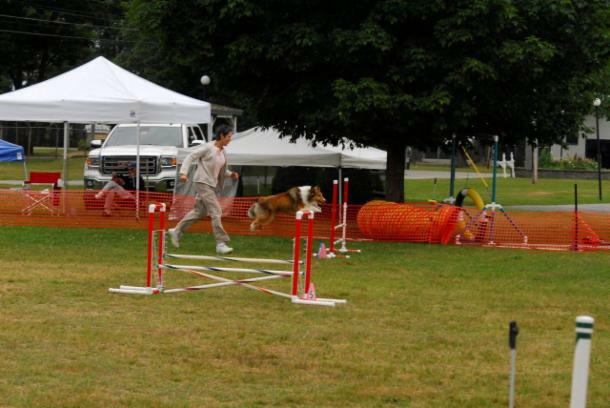 Patty and Willow completing a 3rd leg and qualifying for their Rally Novice Ob Title at the PVKC dog shows! 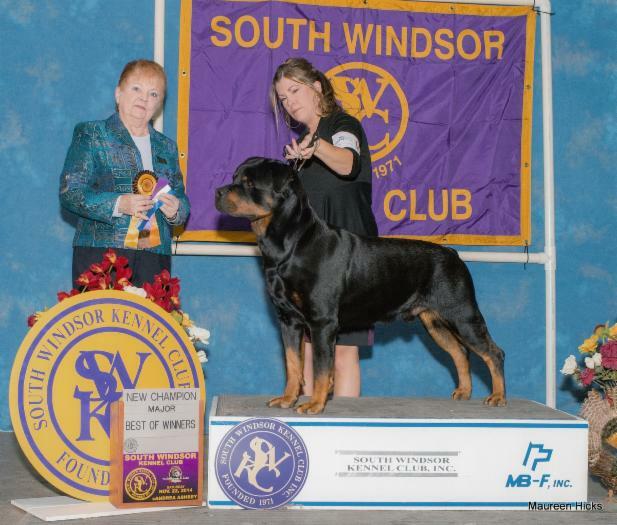 Eric (shown above & below) first time in the show ring qualified 3 consecutive days in a row with Sammy to earn their Rally Novice Title with placements at the PVKC/LAKC dog shows! 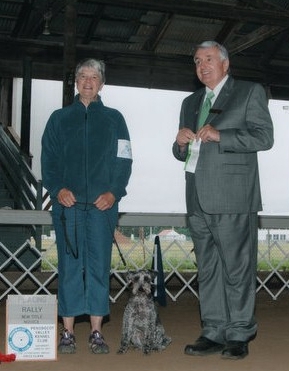 Renae & Dakotah earning a 1st placement in Novice Obedience for a 2nd CD leg as well as a qualifying score in Rally Advanced for a New RA Title Sept 2013! 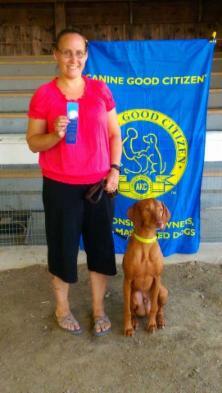 Renae and Dakotah shown above earning 1st placements in both Novice Obedience and Rally Advanced Obedience Sept 2013! Renae and Dakotah after earning a 1st placement in Rally Advanced at the PVKC Match Sept 2013! They went on to win High In Trial from the regular classes! 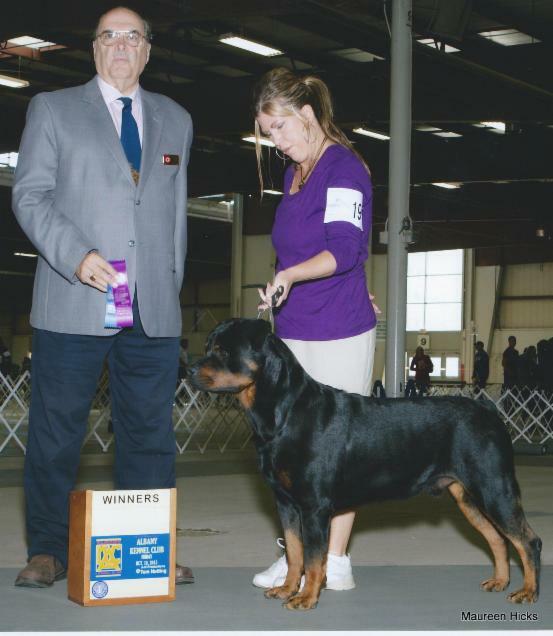 Crystal's very first time in the show ring earning a 1st rally leg with Vanna at the PVKC dog shows! 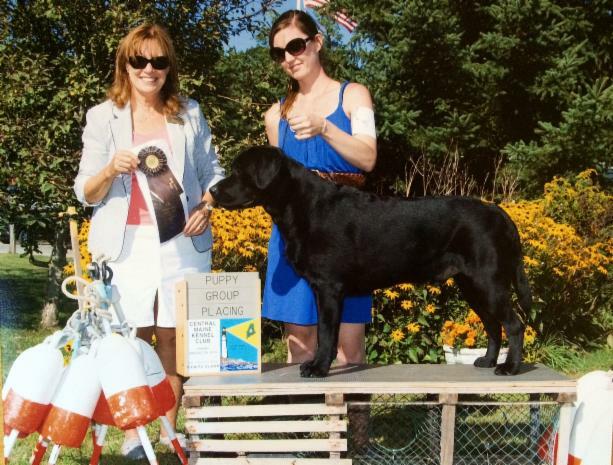 Maureen and Cruize taking back to back Winners Dog awards for 2 more points! 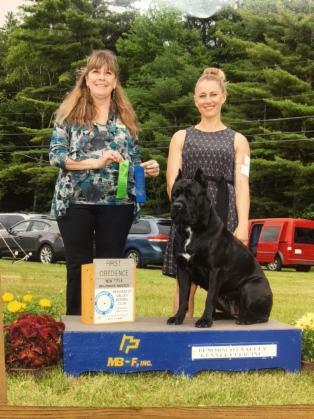 Maureen and Cruize earning qualifying legs 3 consecutive days in a row for their Rally Novice Title with a 1st & 4th placement at the Vacationland Dog Club Shows May 2013! Renea & Dakota earning 2 Rally Advanced legs with a 1st & 2nd placement! 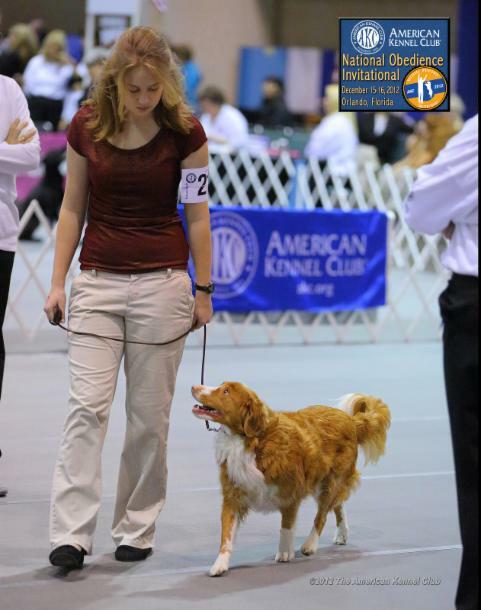 Molly, our Junior Handler, attending the invitation only Eukaneuba National Obedience Competition in Florida in December of 2012. We are very proud of this team! 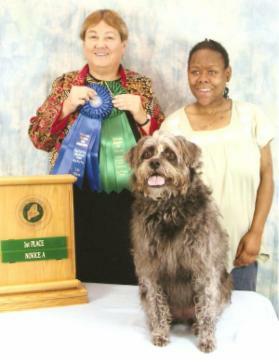 Maureen & Graydee finishing their AKC Championship with a 3rd Major at the Albany KC shows Oct 20, 2012! 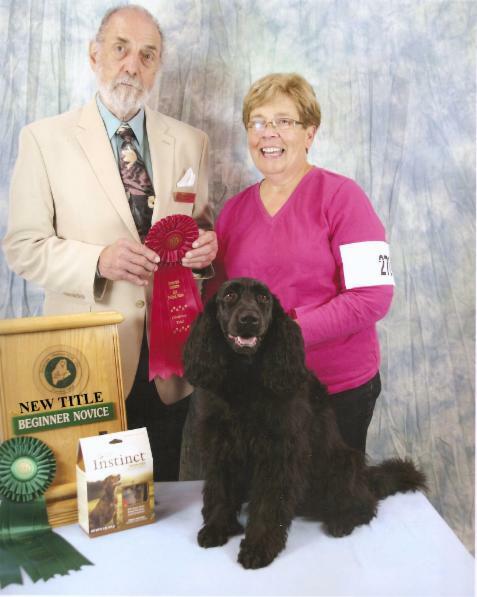 Pat and Katie completing their Beginners Novice title with a second placement! 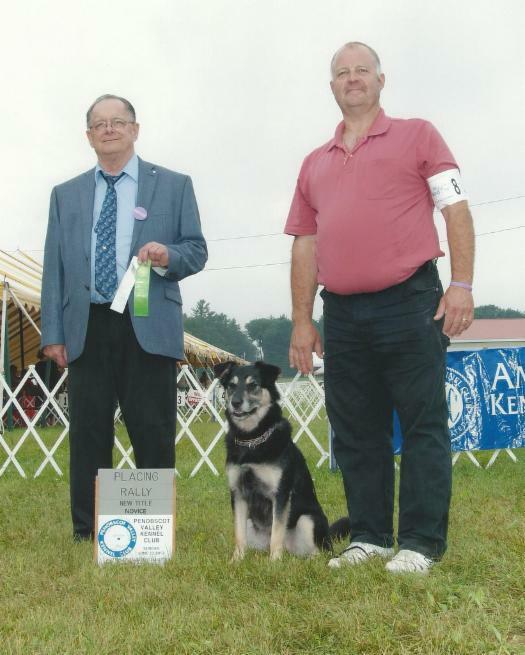 Renae and Dakota earning a second placement their first time out in Novice A Obedience at the Sacarappa Obedience Club show Sept 2012! 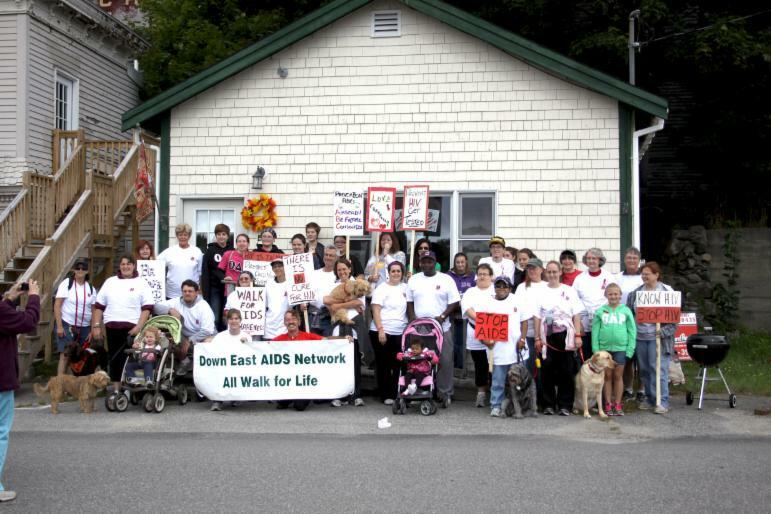 "Josie" is being held above the sign, then to the right "Kiku" (Lotti's dog - gray - being walked by her adopted sister Bea who was also born with HIV) then to the right Dakota (yellow lab) all helped my students and their friends gather over $2800.00 in donations for the Downeast AIDS Network in Machias last weekend. Way to go everyone! Lotti would be proud of you all! Shown above, Maureen & Graydee taking back to back 3pt Majors at the Union ME Shows Sept 2012!! 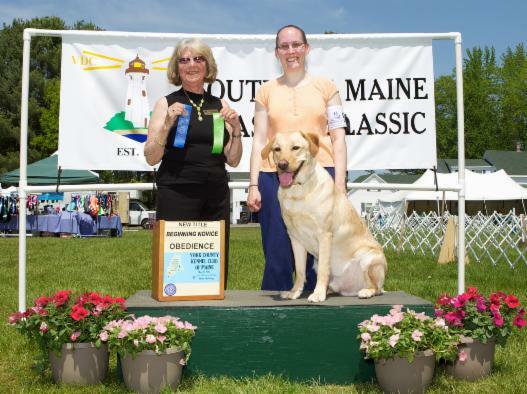 Shown Above: Renae and Dakotah with first placements for two runs through Rally Advanced at the PVKC Match in Bangor 9/08/12 and were the only qualifiers as well as High In Trial from the Novice A Obedience Class! 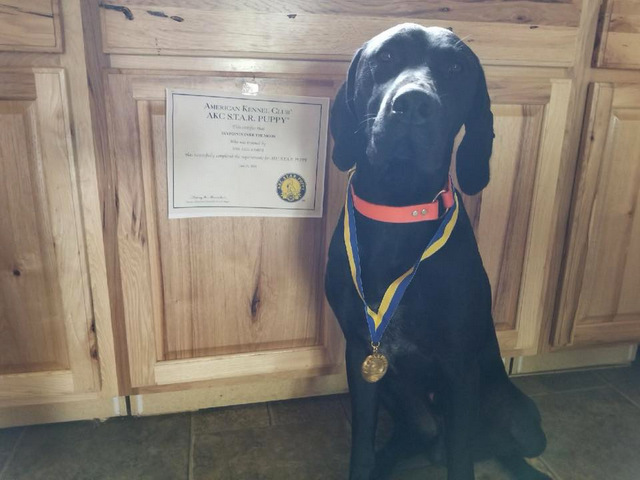 Spirit has an AKC Canine Good Citizen Title and is certified as a Therapy Dog by Therapy Dogs Incorporated. We are also approved for visits at the VA @ Togus Hospital and we’ve been going weekly to St. Mary’s Hospital here in Lewiston, visiting the Alcohol/Drug and Psychiatric Wards every Tuesday morning. One of the Therapists (shown in first picture) has told me that we’ve likely interfaced with 1200-1500 patients in the past 14 months! 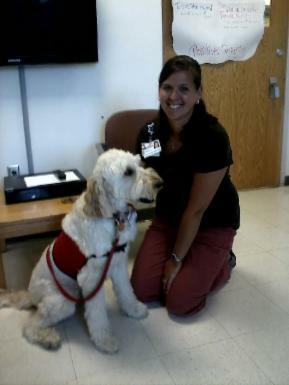 We’ve found the Staff appreciates her visits as much as the patients! Everyone at the Hospital seems to know her! Not bad for the “Hyper Dog” we started with 3 1/2 years ago! Thanks again for all your help. 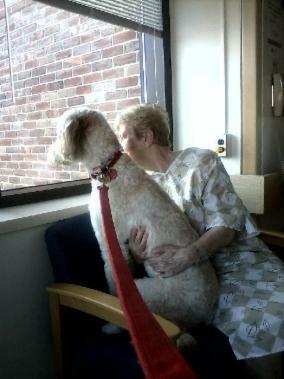 Second picture is Spirit cheering up my wife Betty when she was at Maine Med for a week about a month ago. Renae and Dakotah completing their Novice Rally Title! 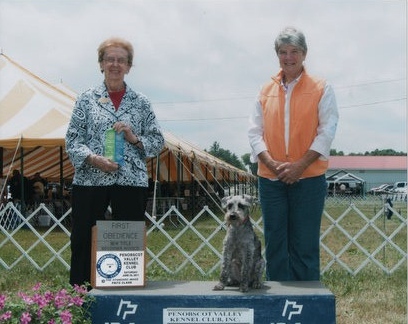 Renae and Dakotah competing in Beginners Novice Obedience taking First Place and completing the Title! 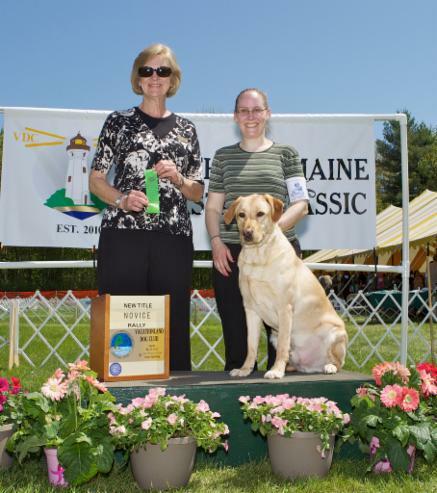 Maureen & Graydee going WB/BOS 3 out of 4 days of conformation competition in Cumberland Maine June 2012! Reva and Bentley earning a final qualifying leg and a 1st placement for their CD Title! 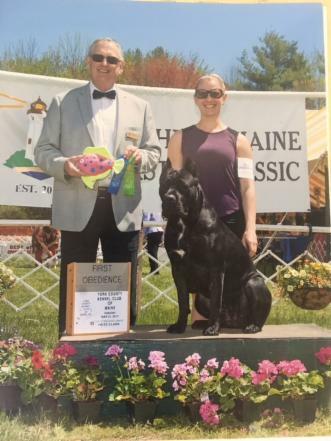 First time ever at a dog show for either handler or dog...Fritz and 8+yr old "Soca" qualify with an 82 out of 100 at the May Maine shows for the first leg toward their Rally Novice title! 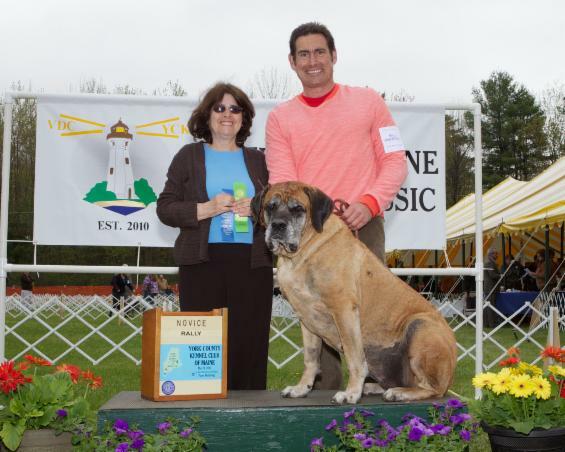 Congratulation to Pat and "Katie" (one of our P.A.L. 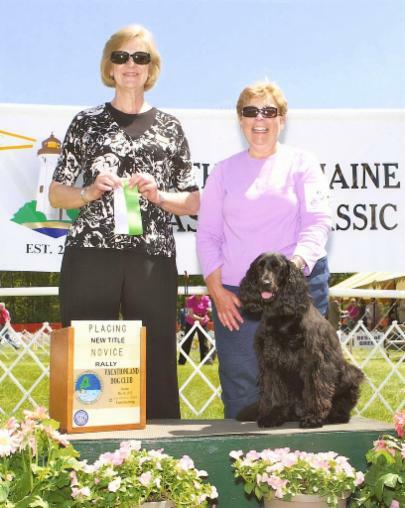 dogs) from the Machias classes for finishing their Rally Novice title in three consecutive days at the Maine shows May 2011! 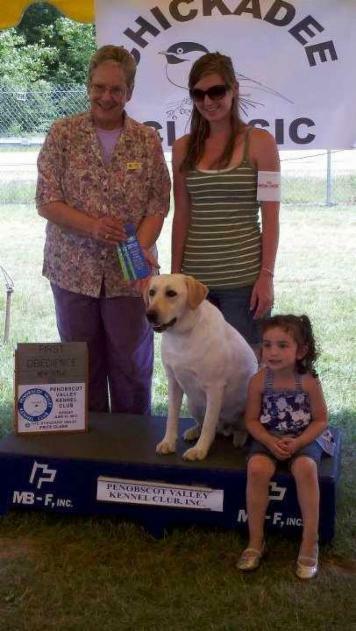 A first time competing in obedience for both! Molly and Zoe qualify for their Rally Excellent Title with a 3rd Placement! 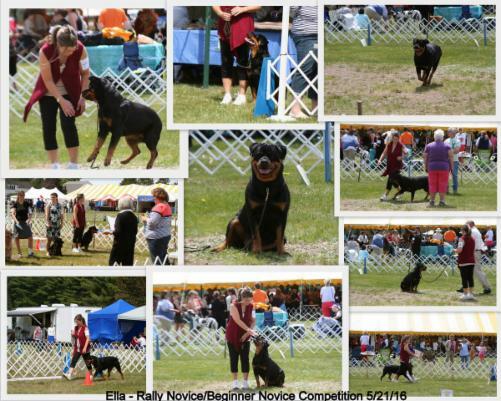 Renae and Dakotah from the Machias class - 2nd place Rally Novice (upper left), 2nd place Beginner's Novice Obedience (upper right), and 4th place Rally Novice (bottom). Sacarappa, ME 11 Sept 2011. And at the same venue Lotti and Kiku achieved the Rally Novice title AND High in Rally Trial award. 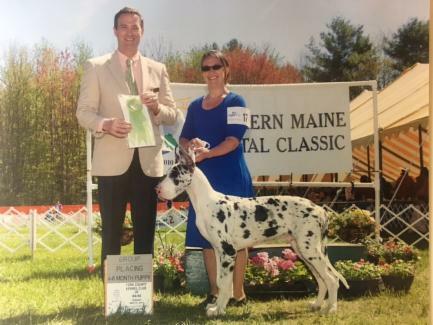 (We believe this is the second Rally Novice title earned in Maine by an All American team, the first going to another Machias student with her All American "Kai". 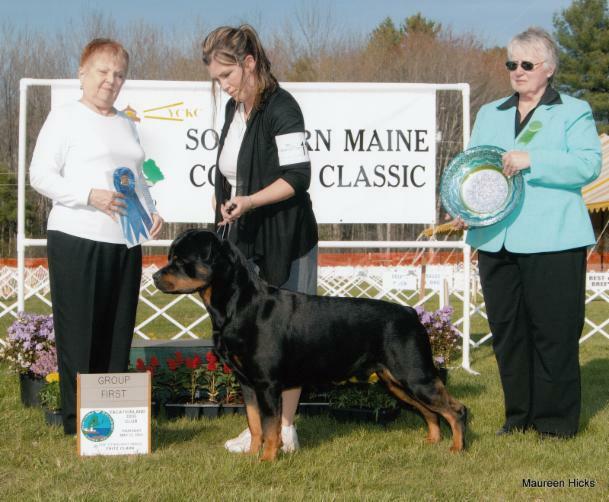 Penobscott Valley KC Match, Sept 2011, Bangor, ME. 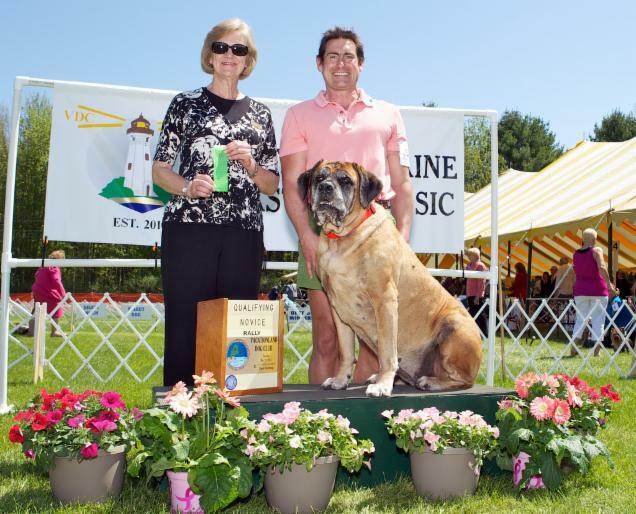 Congratulations to our first "All American" titled dog in Maine. 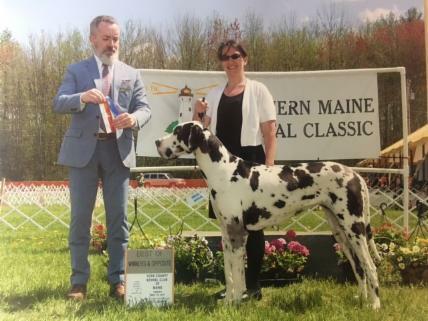 Three back to back shows, three qualifying scores with placements and a new "Beginners Novice" title at Penobscott Valley Kennel Club shows in Maine! And at the same weekend in Maine a finished Rally Novice title. Again three qualifying scores with placements in three back to back shows! 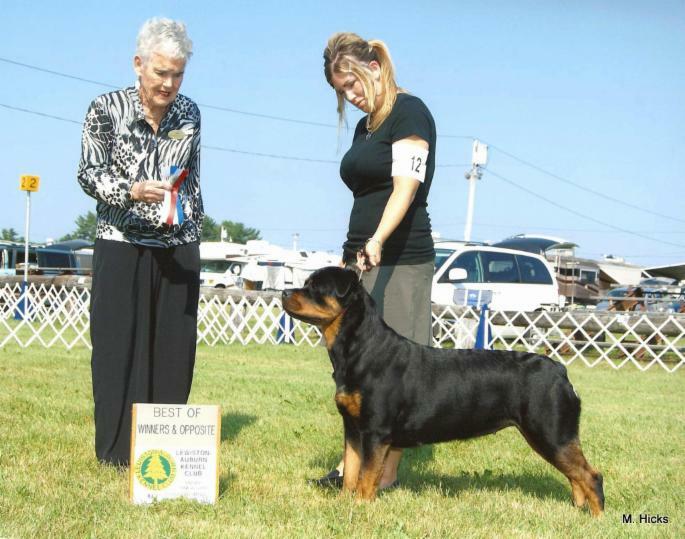 This was Kai's first time competing at an AKC dog show.